« You Can Save Every Day!!! Debt can ruin you financially and physically if it is not handled with care. Prevention is always better than cure, but what if you are already caught in a debt trap? We will look at the before and after debt scenarios. Jane just got a new job and is very excited. She immediately goes shopping and buys a lot of beautiful outfits as she wants to make a good impression on all her new colleagues. As Jane is short of cash she cannot really afford this big expense. • Is it not better to rather get a few mix and match outfits that will cost me so much less and can look just as pretty when I wear it with some of the accessories I already have at home? • What about my budget?, can I really afford this monthly debt if I take my other expenses in consideration like what it is going to cost me to travel to work etc. Jane could not resist the temptation to take all the outfits, she reasons that she is going to receive a good salary and convinces herself she will be able to keep up the monthly instalment. Month end comes, she receives her salary slip and to her shock, she goes home with much less than she thought as she did not think about the uif, tax and other deductions that get deducted from her gross salary. 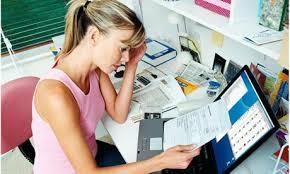 She regrets being impulsive when she sees that she is left with virtually no money after paying her account. After 3 months she starts to think of a way out. She got the “brilliant” idea to apply for a credit card; she can then pay her account and buy food and other necessities on the credit card. Soon she maxed out her card and apply for another one, she maxed that out as well. Jane applied for a consolidation loan to settle her credit cards and other accounts. Temporary relief only, she may be saving a few bucks per month but is paying a much higher interest rate on the loan account. Soon she needs extra money again as her car broke down and she had to pay for repairs, so back to the credit cards it is. Now here expenses are even more than before and due to her reckless debt behaviour, she starts to skip instalments, resulting in her getting a poor credit record. She decides to sell her car and travel to work using public transport as this is a cheaper way of travel. It is good to save money by using public transport, but in Jane’s case she is not really saving as she had to pay most of the money she got for the car on debt and soon she is back to square one again. By not having a good credit record any more, she now applies for a loan from lenders offering unsecured loans as the banks did not want to give her credit. The interest rates are much higher than that of a secure loan and she is indeed sinking deeper and deeper into debt. Her worries about money is now starting to affect her health and work as she is always stressed and cannot be as productive at work as she should be due to being stressed all the time. There is a way out for Jane. • She can speak to her employer or her family and see if the can perhaps assist here with a no or low interest loan so she can pay all her debts. She then has to close all the accounts for good. • If her work or family cannot help she can still get out of this situation but it will take longer. • She can apply for a loan to settle some of her small accounts, but only if the instalment will be less than the combined instalment of these accounts. • She now needs to pay this loan in full and then she can apply for another one to settle the next debt. If Jane has the determination to carry on like this until all her debt is settled,and have the willpower not to open any other accounts again she can recover physically and financially living a stress free life again.